Israel is the largest recipient of US taxpayer-funded military aid and these weapons are used by Israel to commit systematic human rights abuses against Palestinians. BBC journalist Jihad Masharawi holding his 11-month-old son, killed in Gaza on 14 November 2012 by an Israeli airstrike. On November 18, an Israeli air force pilot flying a US-made F-16 fighter jet fired a missile at the four-story home of the al-Dalu family in Gaza City, killing ten members of the family and two from the al-Muzannar family next door. Yet, when it comes to US policy toward Palestinians, this rhetoric rings hollow. The United States arms Israel to the teeth, fails to uphold US human rights laws when Israel uses US weapons to commit abuses of Palestinians and, up to this point, has thrown around its diplomatic heft in international forums to shield Israel from the war crimes prosecutions advocated for by Human Rights Watch and others. Israel’s recent killing of members of the al-Dalu and al-Muzannar families is a tragic reminder of why 15 leading church figures sent Congress a letter in October arguing that “unconditional US military assistance to Israel” plays a role in “sustaining the conflict and undermining the long-term security interests of both Israelis and Palestinians.” These church leaders urged Congress to hold hearings into Israel’s violations of the Arms Export Control Act, which limits the use of US weapons to “internal security” and “legitimate self-defense,” and to examine Israel’s eligibility for any form of US assistance, given that the Foreign Assistance Act prohibits US aid to countries that engage in a consistent pattern of human rights violations. Such a reevaluation of US military aid to Israel, which is scheduled to amount to $30 billion from 2009 to 2018, is desperately needed. Israel is by far and away the largest recipient of US taxpayer-funded military aid and it is patently obvious that these US weapons are being used by Israel to commit systematic human rights abuses against Palestinians. For example, the fighter jet whose missile devastated the al-Dalu and al-Muzannar families very well may have been one of the 93 F-16D fighter jets, valued at $2.5 billion, which US taxpayers financed and transferred to Israel in the previous decade. However, far from examining Israel’s misuse of US weapons in its most recent attack on Gaza, much less holding it accountable, the Obama administration is moving forward with a proposed weapons deal that would replenish Israel’s arsenal. While Clinton offered platitudes about standing against aggression on International Human Rights Day, thePentagon was busy that same day notifying Congress that it hopes to ship to Israel 6,900 Joint Direct Attack Munitions tail kits, which “convert free-fall bombs into satellite-guided ordnance,” and more than 10,000 bombs to accompany them. On previous occasions when the international community attempted to hold Israel accountable for its war crimes — most notably with the “Goldstone Report” issued after Israel’s “Operation Cast Lead” killed more than 1,400 Palestinians in 2008 and 2009, and after Israel killed nine humanitarian activists in international waters who were attempting to deliver goods to Gaza in 2010 — heavy-handed US diplomatic pressure and its threatened Security Council veto prevented effective action being taken. But now that the United Nations General Assembly has voted to make Palestine a “non-member observer state,” potentially clearing the way for it to join the International Criminal Court (ICC), Israel may no longer be able to rely on US protection. And as long as the United States refuses to hold Israel accountable for committing human rights abuses of Palestinians with US weapons and keeps the spigot of weapons open, Palestinians should seek redress at the ICC for Israel’s war crimes. Due to ongoing US funding for Israel’s oppression of Palestinians, it is the only route for families such as the al-Dalu and al-Muzanner to take to receive a modicum of justice. Indigenous people have risen up across Canada in the Idle No More movement, a mass call for Indigenous sovereignty, self-determination and rights, against colonization, racism, injustice, and oppression. As Palestinians, who struggle against settler colonialism, occupation and apartheid in our homeland and for the right of Palestinian refugees – the majority of our people – to return to our homeland, we stand in solidarity with the Idle No More movement of Indigenous peoples and its call for justice, dignity, decolonization and protection of the land, waters and resources. We recognize the deep connections and similarities between the experiences of our peoples – settler colonialism, destruction and exploitation of our land and resources, denial of our identity and rights, genocide and attempted genocide. As Palestinians, we stood with the national liberation movement against settler colonialism in South Africa, as we stand with all liberation movements challenging colonialism and imperialism around the world. The struggle of Indigenous and Native peoples in Canada, the United States, have long been known to the Palestinian people, reflecting our common history as peoples and nations subject to ethnic cleansing at the hands of the very same forces of European colonization. The Indigenous resistance across Canada includes struggles against the ongoing theft of indigenous lands, massive resource extraction and environmental devastation (including tar sands and pipelines), the continuing movement of survivors of the genocidal residential school system, and movements to demand an end to the colonial and gendered violence against Indigenous women. The Canadian government, reflecting its own settler colonial nature, was one of the earliest and strongest supporters of the establishment of Israel as a settler colony on Palestinian land and has since that time been a steadfast backer of Israeli wars, occupation, colonization, and oppression against our people. Canada has done so alongside the United States, which shares the same settler colonial nature, legacy of genocide, and massive support for Israeli occupation, colonization and apartheid. Canadian Prime Minister Stephen Harper’s government has pronounced itself “Israel’s best friend,” supporting its assaults on Lebanon and Gaza and consistently attacking Palestinian rights both on the international stage and within Canadian borders. At the same time, it has embarked on a program of refugee and migrant exclusion, cuts to refugee health care, attacks on workers’ rights, support for massive resource extraction and environmental devastation – and attacks on Indigenous rights and sovereignty on treaty and unceded land. Harper and his government’s expansive praise for Israeli settler colonialism and apartheid is simply the other side of the same coin that attacks Indigenous self determination and plans massive resource extraction on Indigenous land. We salute the Idle No More movement and the unity of indigenous people around its calls for justice, as well as the courageous hunger strike of Chief Theresa Spence. We note that this movement belongs to all Indigenous people and was launched by youth and women. Our struggle as Palestinians is the same – rooted in all of our people and finding its greatest strength in youth and women’s leadership. 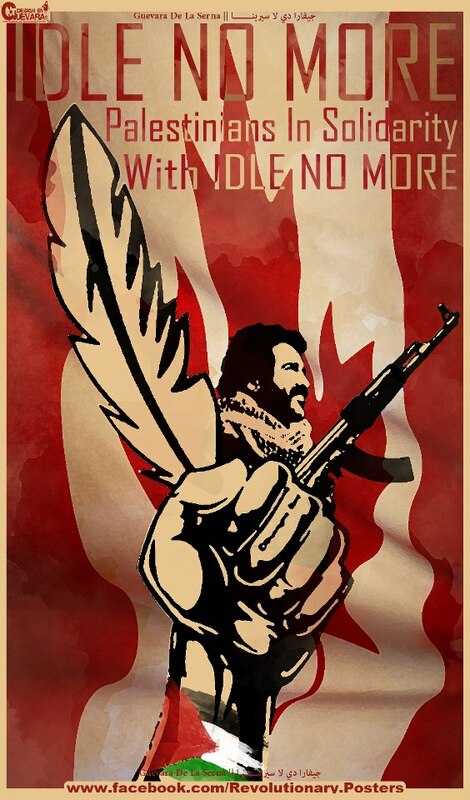 Now is the time – from Canada/Turtle Island to Palestine, we must all be “Idle No More” , and take a stand: against colonialism, against occupation, and for self-determination, sovereignty, rights and justice for Indigenous peoples. ALEPPO PROVINCE, Syria/BEIRUT (Reuters) — Syria’s opposition leader has rejected an invitation from Russia for peace talks, dealing another blow to international hopes that diplomacy can be resurrected to end a 21-month civil war. Russia, President Bashar Assad’s main international protector, said on Friday it had sent an invitation for a visit to Moaz Alkhatib, whose six-week-old National Coalition opposition group has been recognized by most Western and Arab states as the legitimate voice of the Syrian people. “I think a realistic and detailed assessment of the situation inside Syria will prompt reasonable opposition members to seek ways to start a political dialogue,” Lavrov said on Friday. Russia says it is behind the efforts of UN mediator Lakhdar Brahimi, fresh from a five-day trip to Damascus where he met Assad. Brahimi, due in Moscow for talks on Saturday, is touting a months-old peace plan for a transitional government. That UN plan was long seen as a dead letter, foundering from the outset over the question of whether the transitional body would include Assad or his allies. Brahimi’s predecessor, Kofi Annan, quit in frustration shortly after negotiating it. Russia’s Middle East envoy, Deputy Foreign Minister Mikhail Bogdanov, who announced the invitation to Alkhatib, said Russian officials were ready to meet him in another country. He said further talks were scheduled between the “three Bs” – himself, Brahimi and US Undersecretary of State William Burns. Speaking in Damascus on Thursday, Brahimi called for a transitional government with “all the powers of the state”, a phrase interpreted by the opposition as potentially signalling tolerance of Assad remaining in some ceremonial role. The United Nations press office in New York said Brahimi had not specifically said Assad should remain in office until the end of his presidential term in 2014. Brahimi had said the transition “should start as soon as possible, that a government should be established as soon as possible, and that he hopes that the crisis can be solved in 2013 because it cannot wait until 2014”, it said in a statement. “We do not agree at all with Brahimi’s initiative. We do not agree with anything Brahimi says,” Colonel Abdel-Jabbar Oqaidi, who heads the rebels’ military council in Aleppo province, told reporters at his headquarters there. 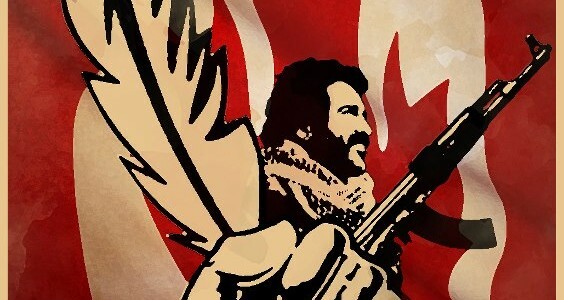 Oqaidi said the rebels want Assad and his allies tried in Syria for crimes. Assad says he will stay on and fight to the death if necessary. In the rebel-held town of Kafranbel, demonstrators held up cartoons showing Brahimi speaking to a news conference with toilet bowls in front of him, in place of microphones. Banners denounced the UN envoy with obscenities in English. Diplomacy has largely been irrelevant to the conflict so far, with Western states ruling out military intervention like the NATO bombing that helped topple Libya’s Moammar Gadhafi last year, and Russia and China blocking UN action against Assad. Meanwhile, the fighting has grown fiercer and more sectarian, with rebels mainly from the Sunni Muslim majority battling Assad’s government and allied militia dominated by his Alawite sect, an offshoot of Shiite Islam. Still, Western diplomats repeatedly have touted signs of a change in policy from Russia, which they hope could prove decisive, much as Moscow’s withdrawal of support for Serbian leader Slobodan Milosevic heralded his downfall a decade ago. Bogdanov said earlier this month that Assad’s forces were losing ground and rebels might win the war, but Russia has since rowed back, with Lavrov last week reiterating Moscow’s position that neither side could win through force. “As the situation changes on the battlefield, more incentives emerge for seeking a way to stop the military action and move to a phase of political regulation,” said Dmitry Trenin, director of the Carnegie Moscow Center. Meanwhile, on the ground the bloodshed that has killed some 44,000 people continues unabated. According to the pro-opposition Syrian Observatory for Human Rights, a monitoring group based in Britain, at least 120 people were killed on Friday, a typical toll as fighting has escalated in recent months. Activists said at least 13 people, including seven children aged five under, were killed in an air strike on the town of Safira southeast of Aleppo city. Video footage released by the activists showed several collapsed concrete buildings and at least 20 people searching through the rubble for survivors. In Aleppo, Syria’s northern commercial hub, clashes took place between rebel fighters and army forces around an air force intelligence building in the Zahra quarter, a neighborhood that has been surrounded by rebels for weeks. BEIRUT — Syrian rebels stepped up their siege of a government helicopter base and clashed with soldiers near Aleppo’s international airport on Friday, part of an effort to chip away at the air power that poses the biggest challenge to their advances against the regime of President Bashar Assad. That airborne threat came into stark relief the same day, when a government airstrike on a northern town killed 14 people – most of them women and children, activists said. More than 21-months into Syria’s conflict, the Assad regime is counting more than ever on its air force to block rebel gains. Rebels in the north, a region largely clear of government troops, realize this and have launched campaigns to seize all the area’s airports, hoping such a move will protect their forces and the civilians who back them. This push in many ways represents the mismatched nature of Syria’s civil war, with numerous but lightly armed rebels fighting a highly sophisticated army, albeit one badly weakened by defections. “The airports are now considered the most important thing the rebels can focus on because all of the strikes now come from the air,” said Aleppo activist Mohammed Saeed via Skype. Saeed said clashes between rebels and government soldiers raged until Friday morning around the Mannagh helicopter base near the Turkish border. He said other rebel groups continued to hold positions around the Kuwiras military airport southwest of the city of Aleppo and clashed with soldiers near Aleppo’s international airport and neighboring Nerab military airport. But Assad’s forces still control the air, responding to rebel gains with airstrikes on their positions or residential areas, a tactic rebels consider collective punishment against civilians who back the revolt. The fall of any of Aleppo’s airports would give a psychological boost the areas rebels and give them greater freedom of moment since ground forces often shell from inside the airports. International diplomacy has failed to slow Syria’s crisis, which anti-regime activists say has killed more than 40,000 people since March 2011. Also on Friday, Russia’s foreign minister said Moscow had proposed talks with the main Syrian opposition coalition, even though it has criticized Western countries for recognizing the group. “The Syrian people haven’t heard one fair word from Russia to the Syrian people, especially to the children, innocent people and civilians who are killed every day with Russian weapons,” he said. Russia is one of Assad’s strongest backers, although top officials have recently expressed some resignation to the idea that he could fall. Still, Russia opposes international calls for his ouster and wants a negotiated solution to the conflict. (Reuters) – Israeli Prime Minister Benjamin Netanyahu’s Likud party is set to win a parliamentaryelection on January 22 although the popularity of a far-right party opposed to Palestinian statehood is growing, polls showed on Friday. Two out of three surveys showed the right-wing Likud losing voters to political newcomer Naftali Bennett’s religious party Bayit Yehudi (Jewish Home)and to a fractured center-left bloc. All still predicted a strong right-wing coalition emerging in the 120-seat parliament, which would assure Netanyahu another term. The daily Yedioth Ahronoth published a poll with Likud winning 33 seats, four less than a month ago. A poll in the Jerusalem Post showed Likud fell to 34, down from 39 just two weeks ago. A survey by Maariv said Likud held ground at 37. Without a majority in parliament, Likud would have to join forces with other parties to form a government. Netanyahu could choose Bennett and ultra-Orthodox religious parties or team up with members of the center-left bloc. The left-leaning Labor party remained in second place in all the polls, winning 17 or 18 seats. Bennett’s party platform rejects a two-state solution with the Palestinians and is staunchly in favor of settlement building in the occupied West Bank – an issue which has stalled peace talks. All the polls show him on an upward trend, winning between 12 and 14 seats. The campaign issued by grassroots networks and organizations across Palestine, calls to suspend EU-Israel Association Agreement and ACAA. On the fourth anniversary of Israel’s 2008 war on Gaza in which it killed 1400 Palestinians including 300 children, a call urging EU citizens to ask their representatives to suspend the EU’s trade agreements with Israel, until it complies with international law, has been issued by Grassroots networks and organizations across Palestine. FALLUJAH, Iraq – Tens of thousands of Iraqi Sunnis angry over perceived second-class treatment by the Shiite-led government massed along a major western highway and elsewhere in the country Friday for the largest protests yet in a week of demonstrations. The biggest of Friday’s demonstrations took place on a main road to Jordan and Syria that runs through the cities of Fallujah and Ramadi in the Sunni-dominated desert province of Anbar, west of Baghdad. Several thousand protesters took to the streets in Fallujah, holding aloft placards declaring the day a “Friday of honor.” Some carried old Iraqi flags used during the era of former dictator Saddam Hussein, whose Sunni-dominated government was ousted in the U.S.-led invasion nearly a decade ago. Massive crowds also blocked the highway in Ramadi, further to the west, to demand “fair treatment” from the government and the release of prisoners, said Dhari Arkan, the deputy governor of Anbar province. The demonstrations follow the arrest last week of 10 bodyguards assigned to Finance Minister Rafia al-Issawi, who comes from Anbar and is one of the central government’s most senior Sunni officials. While the detentions triggered the latest bout of unrest, the demonstrations also tap into deeper Sunni fears that they are being marginalized by the government of Prime Minister Nouri al-Maliki. Although the government includes some Sunni Arabs and Kurdish officials as part of a power-sharing agreement, it draws the bulk of its support from Iraq’s majority Shiites. Vice President Tariq al-Hashemi, another top-ranking Sunni politician, is now living in exile in Turkey after being handed multiple death sentences earlier this year for allegedly running death squads – a charge he dismisses as politically motivated. Vader en stiefmoeder kunnen en willen met de hieronder aangedragen feiten aantonendat het dochtertje van vader reeds sinds 2006 werd, en tot op heden nog steeds wordt onthouden van noodzakelijk(e) medisch(e) onderzoek en behandeling i.v.m. haar bij de geboorte opgelopen“Erbse Parese”! Het was vader bekend dat dochtertje sinds oktober 2009 door pleegouders van door het UMC noodzakelijk geacht onderzoek ten behoeve van reductie van de beperkingen en verbetering van haar mobiliteit, werd onthouden en dat bovendien door de opstelling van kinderarts D. van het M.ziekenhuis, de noodzakelijke fysiotherapie in april 2010 dreigde te worden stopgezet en derhalve kon worden gesproken van bedreiging van een volwaardige lichamelijke gezondheid van dochtertje. Dit vormde voor vader dan ook de legitieme aanleiding dochtertje aan het pleeggezin te onttrekken. Vader was daartoe vanuit zijn gezaghebbende hoedanigheid immers wettelijk verplicht! De onderstaand geciteerde brief d.d. 21 september 2011, van de pleegzorgmedewerker V.aan de huidige gezinsvoogd van dochtertje, M. toont aan, dat reeds in 2006 het Universiteits Medisch Centrum (UMC), een MRI scan in het belang van dochtertje achtte en dat de toenmalige gezinnsvoogd: B. dochtertje deze MRI scan heeft onthouden. Jeugdzorg heb ik een gesprek met pleegmoeder gehad. Dit gesprek vond plaats n.a.v. de volgende informatie in genoemde brief onder het kopje ‘Anamnese’ : “Er werd toen besioten om een MRI onder narcose te vervaardigen, dit is echter niet geëffectueerd, ze is hiervoor bij herhaling opgeroepen door het UMC. Ook heeft er elektronische briefwisseling plaatsgevonden tussen de biologische vader van dochtertje en de neurochirurg, M. Pleegmoeder gaf als reactie op bovengenoemde informatie het volgende aan: “in 2006 kwam het advies voor een MRI onder narcose. Dit advies is met Jeugdzorg besproken. De toenmalige voogd van Jeugdzorg, B. heeft in overleg met betrokkenen besloten dat een MRI onder narcose, gericht op een operatie, toen niet moest plaatsvinden, daar hij van mening was dat dit in die periode niet in het belang van dochtertje was.De overwegingen die toen golden waren de geringe bewegingsbeperking van de arm/schouder van dochtertje met daarbij haar emotionele kwetsbaarheid. Tevens was bekend dat het UMC bij de operatie van 2005 (informatie vader) heeft aangegeven dat een positief effect van deze operatie tot het 4e jaar kan plaatsvinden. De uitnodigingen van het UMC voor een MRI onder narcose hebben pleegouders in die tijd niet ontvangen. Deze zijn in die periode verstuurd naar Jeugdzorg Groningen. De pleeggezin plaatsing was, op beslissing van de voogd, in die periode nog een geheime plaatsing. De onderstaand geciteerde brief d.d. 22 oktober 2009 van het UMC toont aan dat het UMC nader onderzoek door meerdere specialisten, in het belang van dochtertje achtte en vader daartoe een oproep deed die hij direct doorzond naar het pleeggezin. zend U hierbij een afspraak voor het spreekuur Zenuwletsel. Hier zal dochtertje door meerdere specialisten worden onderzocht. U kunt zich melden op de Poli Zenuwletsel BO-Q. De onderstaand geciteerde verklaring van het UMC d.d. 22 december 2009, inreactie op het verzuim van pleegouders te verschijnen op de afspraak van 22 oktober 2009 en waarin nog eens duidelijk op het belang en de medische noodzaak van onderzoek werd gewezen, toont aan dat de pleegfamilie ten koste van het belang van dochtertje, geen gevolg heeft gegeven aan deze afspraak. Dochtertje is onder controle bij het spreekuur zenuwletsel van het UMC in verband met obstetrische plexopathie links. Bij vorige controles waren er aanwijzingen dat zich een contractuur aan het voordoen is van het schoudergewricht. Derhalve is het belangrijk dat zij nogmaals gezien wordt op dit specialistische spreekuur samen met de orthopeadisch chirurg. Het is ons bekend dat dochtertje in een pleeggezin woont, hetgeen mogelijk praktische bezwaren oproept, maar ons inziens is het medisch noodzakelijk dat wij haar op korte termijn nogmaals controleren. De onderstaand geciteerde passage uit de brief van kinderarts van het M.ziekenhuis, D. (vetrouwensarts jeugdzorg) d.d. 21 april 2010, toont aan dat deze kinderarts, in tegenstelling tot het UMC, ten koste van het belang van dochtertje nader onderzoek op dat moment en fysiotherapie voor langere tijd NIET medisch noodzakelijk achtte. “Gezien het feit dat ze zich uitstekend kan redden, ze kan fietsen en ze kan schommelen, er is slechts sprake van gering krachtverlies, lijkt het niet onverantwoord om gedurende langere tijd de fysiotherapie uit te stellen.Op uw vraag of er medisch bezwaar bestaat tegen een bezoek in het UMC kan ik u meedelen dat er medisch geen bezwaar tegen bestaat, ik kan me wel voorstellen dat er emotionele bezwaren tegen bestaan. “De medische noodzaak voor een herbeoordeling is op dit moment m.i. niet aanwezig. Op 13 april 2010 werd vader door pleegzorg ervan op de hoogte gesteld dat op 20 april een afspraak was gepland voor een bezoek van pleegouders met Linda aan het UMC waarbij pleegzorg, (schandalig genoeg), vader verzocht NIET bij dit onderzoek aanwezig te zijn. Vader had evenwel geen enkel vertrouwen meer in het pleeggezin, noch in jeugd- en pleegzorg en wist dat dochtertje medisch noodzakelijk onderzoek en behandeling sinds oktober 2009 stelselmatig werd onthouden en hij nam juist daarom op 23 juni 2010 dochtertje mee naar het buitenland en heeft haar daar laten onderzoeken en behandelen waarbij werd vastgesteld dat dochtertje weldegelijk regelmatige fysiotherapie niet had mogen ontberen. Vader vernam pas in januari 2012, (uit voornoemde verweerschrift), dat op 20 april 2010 dochtertje uiteindelijk toch in het LUMC is onderzocht en vernam toen ook pas de uitslag die inhield dat er bij dat onderzoek in het belang van dochtertje wederom op een MRI scan werd geattendeerd. Het onderstaande antwoord van Neurochirurg P. per email d.d. 10 februari 2011, op een schrijven van vader waarin hij om z’n mening vraagt over de situatie, toont aan,,,,,, Nou ja,,,,, dit behoeft toch eigenlijk geen verdere uitleg!!! het is inderdaad een moeilijk probleem. als wij als gespecialiseerd centrum zeggen dat het sterk geadviseerd wordt dat zij hier door onze kinderfysiotherapeute en onze orthopaedisch chirurg wordt gezien, en wij daar door anderen worden over-ruled, kunnen wij helaas niets voor u betekenen. mijn brief uit 2009 blijft wat mij betreft nog steeds van kracht. Dochtertje is sinds december 2010 weer terug in het pleeggezin en onderstaande passage uit geciteerde brief d.d. 23 augustus 2011, van kinderarts G.van het M.ziekenhuis toont aan dat tot op heden nog steeds geen MRI scan heeft plaatsgevonden en deze scan en eventuele therapie NIET ZAL PLAATSVINDEN voordat er duidelijkheid bestaat over de juridische situatie, dus over de voogdij! Anamnese: in verband met de uitval van spinale zenuwen C5 en C6 + partieel C7 vond operatieve exploratie plaats op 06-10-2005; hierbij bleek een partiële neurotmesis CS, C6 en een voornamelijk axonotmesis van C5, C6, C7. Geadviseerd werd toen post operatief te starten met kinderfysiotherapie of dit geëffectueerd werd onttrekt zich aan mijn waarneming. Bij poliklinische controle in juli 2006 in het UMC viel op dat er een passieve exorotatie range in adductie fors beperkt was. Ook waren er aanwijzingen voor posterieure subluxatie van de humeruskop. Er werd toen besloten om een MRT onder narcose te vervaardigen, dit is echter niet geëffectueerd, ze is hiervoor bij herhaling opgeroepen door het UMC. Ook heeft er elektronische briefwisseling plaatsgevonden tussen de biologische vader van dochtertje en de neurochirurg. Kinderfysiotherapie vindt sedert de leeftijd van 9 maanden plaats; dit startte kort nadat dochtertje in het pleeggezin was geplaatst. Wij hopen nu toch duidelijk genoeg is geworden dat het verblijf van dochtertje in het pleeggezin en de voogdij bij jeugdzorg een reële bedreiging vormt voor haar gezondheid omdat haar de gelegenheid tot het inperken van de gevolgen van haar “Erbse Pares” al sind 2006 stelselmatig wordt onthouden en daardoor reeds in 2010 aangetoond, scoliose is ontstaan! TEL AVIV, Israel (Ma’an) — Hundreds of Palestinians in the city of Lod, or al-Ludd in Arabic, demonstrated on Friday against attempts by Israel’s government to Judaize the city, Ynet reported. The protest in the Israeli city was organized by the Islamic Movement and other groups and saw demonstrators march from a mosque towards the city center. “They are doing everything to expel all Arabs from Lod. We will not be daunted by this policy. We shall continue to fight and protect our lands,” an organizer of the protest was quoted as saying by Ynet. “We will not allow the Israeli government or any other body to expel us from the city where we were born. Discrimination and racism must be stopped,” another protester was quoted as saying. Around twenty percent, or 1.3 million people, of Israel’s population are Palestinian. They are largely the descendants of Palestinians that managed to remain during the 1948 war, when an estimated 700,000 were expelled from or fled their homes during fighting that would see the establishment of the state of Israel. Rights groups say that Palestinians living in Israel face discrimination in employment, education and public funding within Israel.